Few can deny the versatility of a strikingly designed loafer. As for dress shoes, slip on loafers are both comfortable and stylish, fitting snugly yet never hurting your feet. The very same set of shoes can be easily paired with casual and semi formal outfits. A pair of black slip on loafers will suit everything from blue jeans to cream cargos, while for the more formal, they can even pair with everything from suit pants to corduroys. Most think of loafers as a laid-back shoe which is basically a revamp of a casual slipper, however, these loafers from Skechers reinvent this time-honored design into a contemporary creation, perfect for almost any wardrobe. They function as excellent dress shoes while being durable enough to handle almost any combination of weather and environmental conditions. Here, we’ll be showing you one of the most stylish pairs of slip on loafers available to the style-conscious man. Skechers USA gives us the men’s Caswell Noren slip-on loafer, a true innovation supplying comfort, quality and superior craftsmanship, clear through each aspect of their striking design. Skechers USA has been supplying lifestyle and performance footwear for over 25 years. These supreme-comfort loafers make use of numerous patented technologies which guarantee a great look and a comfortable fit. The company continues to support their trusted brand showcase of classy, versatile products with this new addition to their lifestyle range. The Skechers USA Men’s Caswell Noren Slip-On Loafer gives you a firm fit which stays wearable even after being on your feet for many hours. They are a great pair of comfortable work shoes which can cover as a casual look just as easily. Yet where they truly excel is in the dress shoe department. You will struggle to find a streamlined design which matches the price and the gorgeous looks. Once polished, they hold their luster extremely well. The construction leaves enough flexibility for the shoes to match the form of your feet within a little less than a day, but are of a strong enough strength to still offer a snug, secure fitment even after months of use. The broad range of sizes available makes them a great choice for men and boys of all ages, with the neutral yet contemporary design being just as versatile. Skechers Memory Foam is a patented design technology used in the full-length insole of their Men’s Caswell Noren Slip-On Loafers. This great insole gives high levels of comfort while remaining removable for easy cleaning and replacement if needed. The combination of an EVA sole and their patent memory foam insole ensures that your feet fit the form perfectly while remaining cushioned across every area of the shoe. One of their best features is the lightweight construction. They weigh roughly 12.96 ounces which makes them a pleasure to wear. They are a great shoe for those who spend a lot of time on their feet and should retain their good looks well into the future. They are crease and scuff resistant to a good degree. Some higher priced brands may be known to last even longer, however, the difference in price is normally so large that the men’s Caswell Noren Slip-On Loafer still comes out a clear winner. When turning these great loafers over you will notice a good traction pattern which does a great job of evenly dispersing moisture. Most of the pattern makes contact with the surface that you are walking on, which, in combination with the tactful geometry, ensures traction that should keep you safe in any environment. The adhesive used to affix the outer-sole to the shoe is at times visible, yet this doesn’t pose much of a problem as it fades in no time. Given one polish, any traces of the cementing process are typically gone. One can criticize the Skechers Men’s Caswell Noren Slip-On Loafers for their cemented soles, however, Skechers has done a great job of designing a secure, durable sole, despite their use of welting. 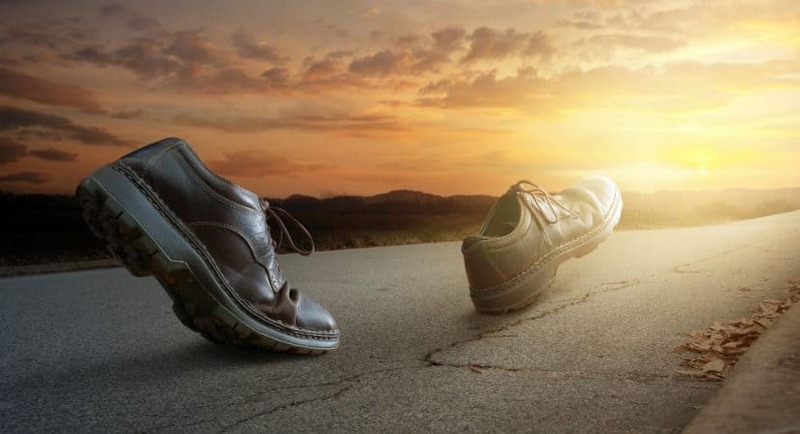 The adhesive used may not last as long as stitching used to secure the soles of higher priced shoes such as those from Rockport, however, those cost almost twice as much. 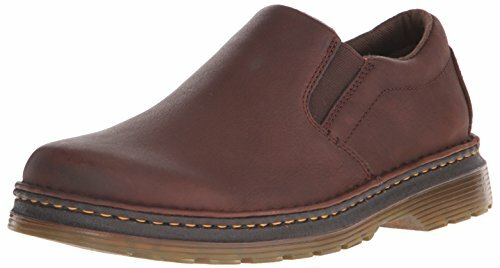 When shopping for a similar design of loafer with matching comfort levels you will find that your top alternatives are the slip on loafers from Rockport and Dr. Martens, yet neither gets the blend of practicality, price and great aesthetics (suited to both casual and formalwear) quite right. Even the slip-on loafers from high-end brands such as Calvin Klein are far too formal for use outside of the office or upmarket events. Skechers have developed yet another shoe that is perfectly suited to the lifestyle of most men. Their slip on loafers carry a simple, minimalistic design which exudes just enough elegance to make them the perfect fit for almost any occasion. Easy to remove, a pleasure to wear and rugged enough to give you good service through extensive use, one cannot fault their convenience nor fashion-conscious construction. 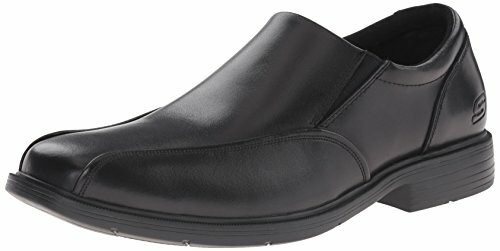 If you want comfort that will leave you feeling as if you are in slippers all day, then look no further than the Skechers USA Men’s Caswell Noren Slip-On Loafer. While some competing brands of a similar style may carry a greater longevity, they also cost as much as two or three times more. You cannot beat the combination of affordability and modern design, while the lightweight composition comes as a bonus. The design style of these loafers could not be better. The appeal begins with the high-gloss leather and neat stitching, while the layered layout of the sole carries sleek lines and secure traction. The Caswell Noren is a proud addition to their range and is one of the more versatile releases out of any dress shoes available. Whether you are looking for form-fitting footwear for business, up-market nightlife or a casual trip around town, these slip-on loafers make for a reliable choice.